It’s Friday the 13th! 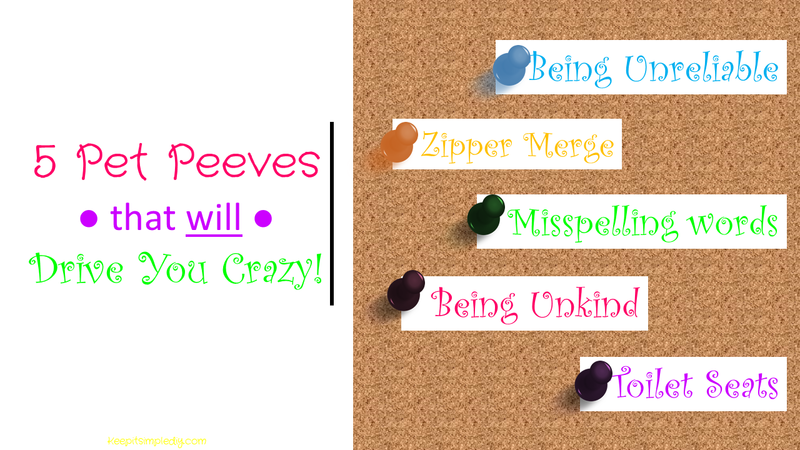 What better topic for a day like today than Pet Peeves!? First, I have a short story for you. I work in accounting and one of my tasks is to place orders. On the last Friday the 13th, I received order number 666. Now how many years of bad luck is that! Seriously everyone! This one gets me every day because there is one merge spot on my way to work that is awful. Now, the correct way to zipper merge is to pick a lane and stay in it until the lane ends. Then, when you merge, you take turns. As the person following proper procedures for zipper merging, I have to be completely on my toes. At any given moment, a car could just suddenly merge back into my lane with no notice or signal. Why? Because they don’t want me getting closer to the front of the line. What they are really doing is putting themselves and others at risk of an accident. And just being impolite. Always treat others with respect. Even when you can’t see the other people around you. There is no need to cut someone off because they are driving in their lane. If you have a problem with waiting in the line, then drive in the other lane. Maybe then the lanes will start to get even. And of course at the merge, take turns. A zipper only works if only one tooth from each side is pulled at a time. 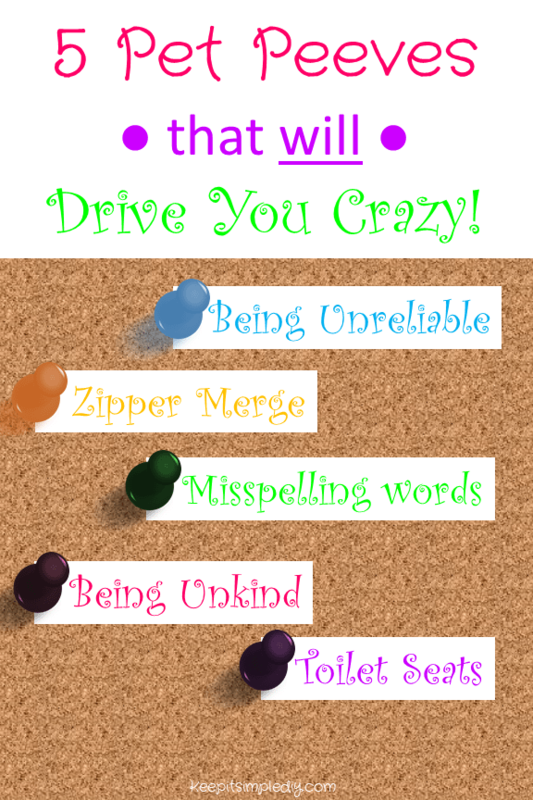 Think back to when you were in elementary school and had to memorize the spelling and meanings of words each week. Spelling and vocab tests. There were even some words that had a particularly long amount of time spent on them. So, you definitely were defiant when you didn’t listen to the differences of to, too, and two or their, there, and they’re. You better believe that the I is before E except after C and that if you disappoint, you will disappear with the extra ‘s’s we will hear. Be a person of your word. Not only does it build respect and trust, it makes people around you happy. To me, nothing is worse than wasting time on someone who doesn’t follow through. I’ve sat waiting for countless hours for people in the past. I’ve heard “I’m on my way” or “I’m leaving in 5” or just radio silence many many times. Either waiting for contractors, or meeting up with friends, either way, this is not polite. Think of the other person before you blow them off. Do the very least and at least give them a courtesy text. Don’t even think of saying you don’t have time! The person waiting for you probably doesn’t have time to waste hours thinking you are coming. Try to put others before yourself and if you make plans keep them. If something comes up and you can’t keep them, give them as much advanced notice as you can. They could be giving up something so they can spend time with you. It would be a shame if they didn’t get to do the thing they gave up because you wasted their time. We’ve got a running theme going on here. Treat other people with respect and always be kind. There is no need to put others down in order to build yourself up. I don’t understand how someone can feel good about themselves knowing they got to where they are by putting others down. I mainly see this in every type of political campaign there is. For some reason, the name of the game is to convince voters why they should not vote for the opponent. Really, they should be convincing you why you should vote for them and showing how good of a person they are by not talking down about anyone. Let’s think of this on a smaller scale. The leaders of the classroom. How do you want the person teaching your child to act? What if they put other teachers down in order to convince people to transfer into their classes? How many people do you think would take their class? Probably not many. Parents and students would choose the nice teacher who has integrity. Now back to the large scale. The leaders of the world. For some reason they think they don’t need to be kind. Not all of them, but a good majority. Be kind to everyone. I feel like many people have complaints about toilets, their seats, and their lids. And, this is a pet peeve that seems to mainly target men who stand to use the restroom. There are many ways things can go wrong for the woman or children who use the restroom after the man. If he leaves the seat up, they could fall into the water if she sits down without looking. Gross! If he leaves the seat down while going to the restroom, he could miss and get urine on the seat. Then, the woman or child could sit on it if no one realized it to clean it up. Gross! Again. If he leaves the puts the seat up and then puts it back down, you can see right into the toilet. Hopefully it’s not dirty. If he puts the lid down after he goes, someone may end up sitting on the lid. Especially if they use the restroom at night when it is dark. So of course, I’ve had all of these happen throughout my life. I prefer to have the seat put down but the lid kept up. That way, I don’t fall in or sit on the lid. As long as the lid was put up and then put back down after, there isn’t really a chance of sitting on urine. And, if you have animals who drink out of the toilet, they can still get to the water. Odd question, but how do you all prefer your toilet seats? I love this!!!! The zipper merge is my biggest pet peeve!! People are so bad at doing it where I live that there is at least on new story on it each year! Haha! Yes, these are “good” ones, to be sure. The merging is what always gets me! Just take turns! It goes sooooo much more smoothly!